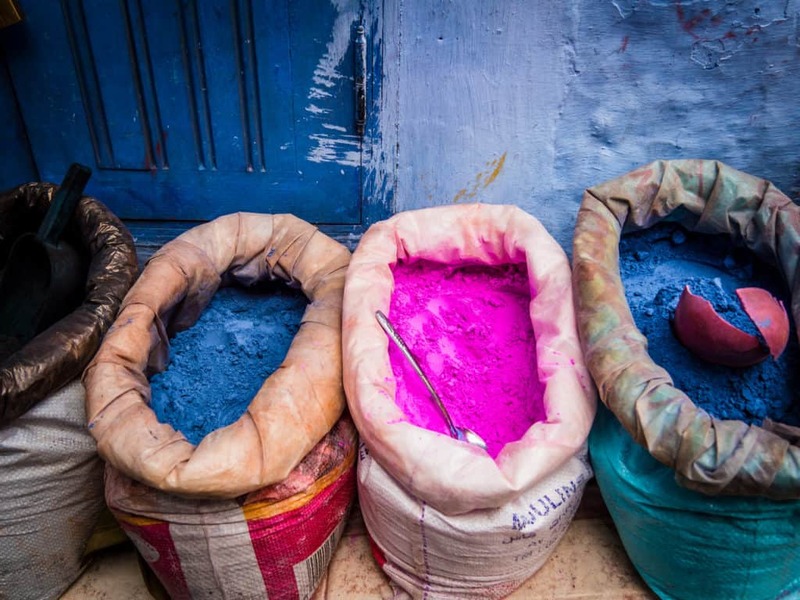 This article is a practical guide to Chefchaouen, the Blue Pearl of Morocco. 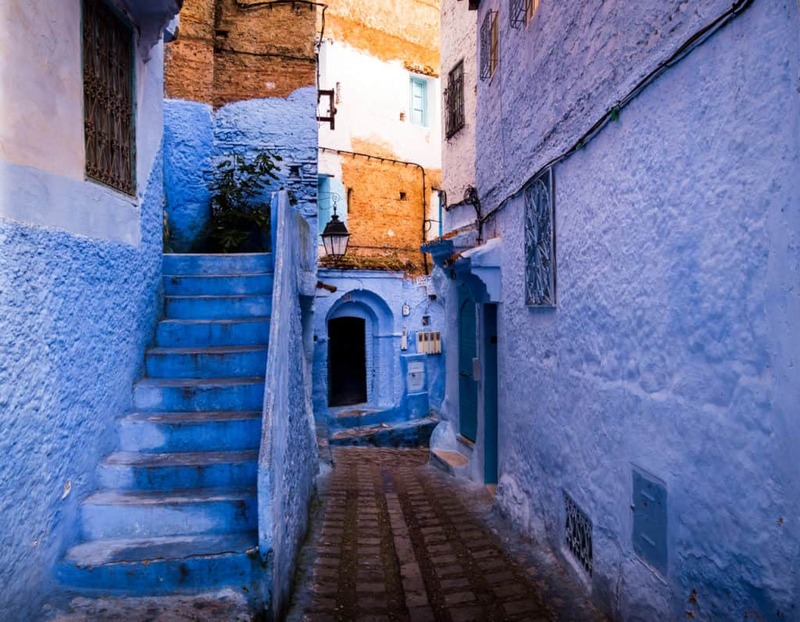 I’ll tell you what are the top things to see and do in and around Chefchaouen, where to stay, how to get there and how to leave from Chefchaouen. 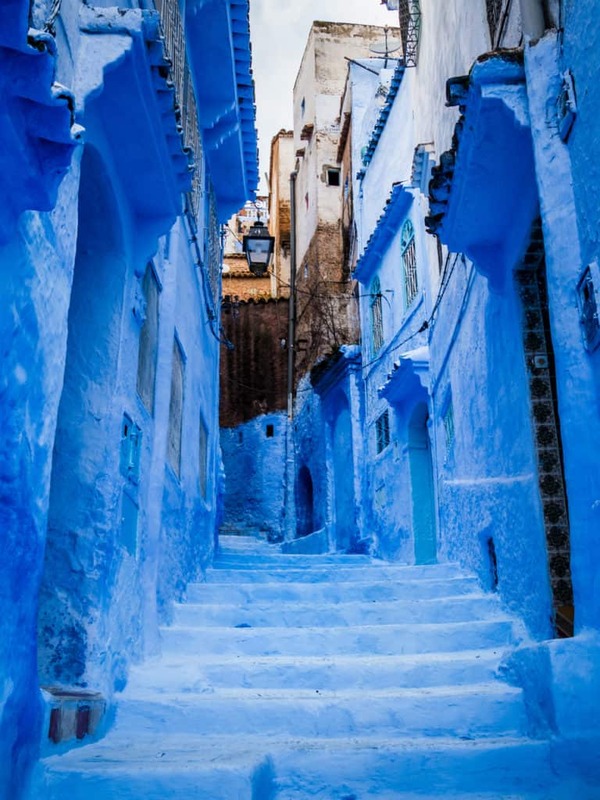 Chefchaouen is a small city in the Rif mountains in the north-west of Morocco. 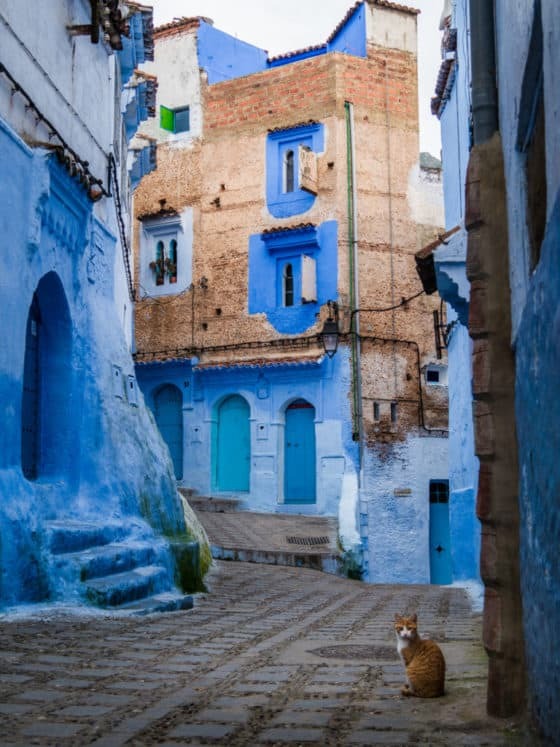 This quirky town is probably one of the prettiest I’ve seen in Morocco because of its blue-washed streets and buildings. That’s why it got nicknamed “the Blue Pearl of Morocco”. 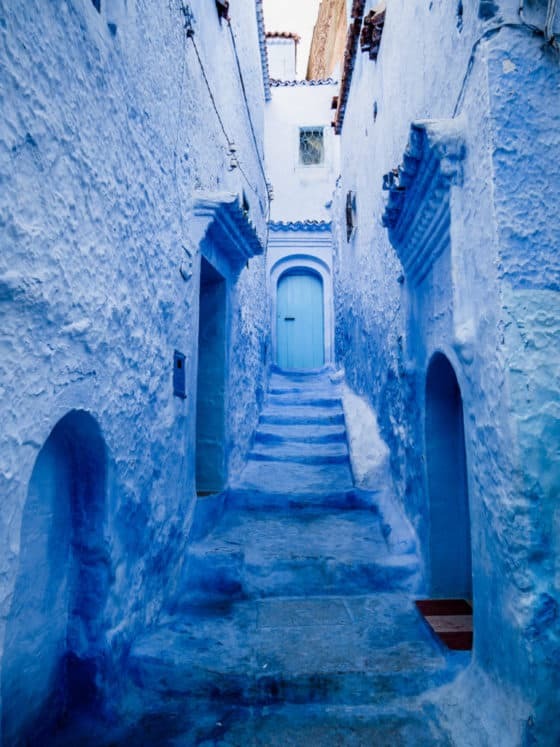 There are many different theories to why Chefchaouen is so blue. Some say that the shades of blue on the walls keep the mosquitoes away, others believe that the blue helps to keep the houses cool during the warm summer months. The most popular theory is that it was painted blue by the Jews who fled to Chefchaouen to escape the Spanish Inquisition in the 15th century. 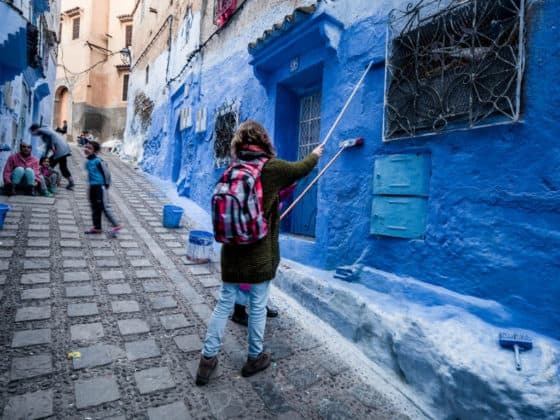 Whatever the true reason for the blue color might be, up until today the locals still apply a fresh coat of paint on their houses about twice a year. Chefchaouen used to be a hidden gem in Morocco but since the rise of Instagram and Pinterest, it became a very touristic place. 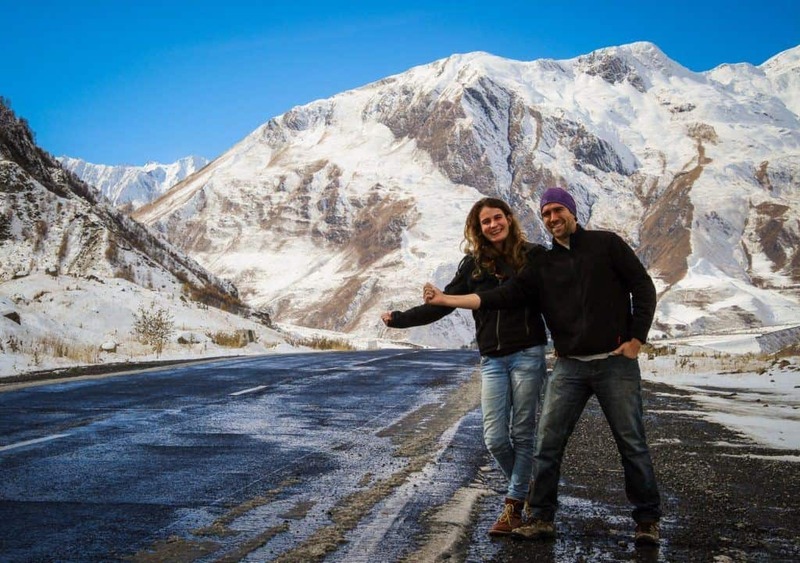 After spending one year in Central Asia and Kyrgyzstan, I wasn’t used any more of seeing so many backpackers in one place. If you visit Chefchaouen during the low season (from late autumn to early spring) like Niko and I did, you can avoid the biggest crowds. 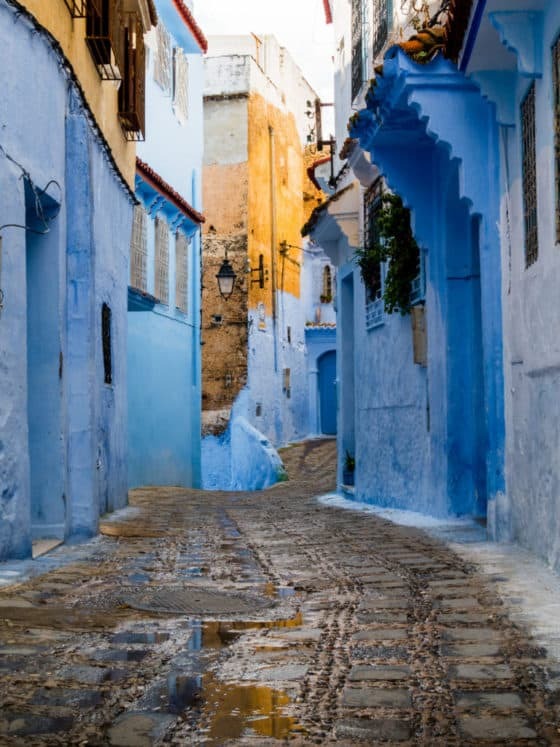 The only downside is that it often rains and it can get really cold during the winter as Chefchaouen is located in the mountains. Although I’m not so fond of visiting touristic destinations, I have to say that I really enjoyed my visit to Chefchaouen. It’s still a unique experience and a photographer’s paradise! 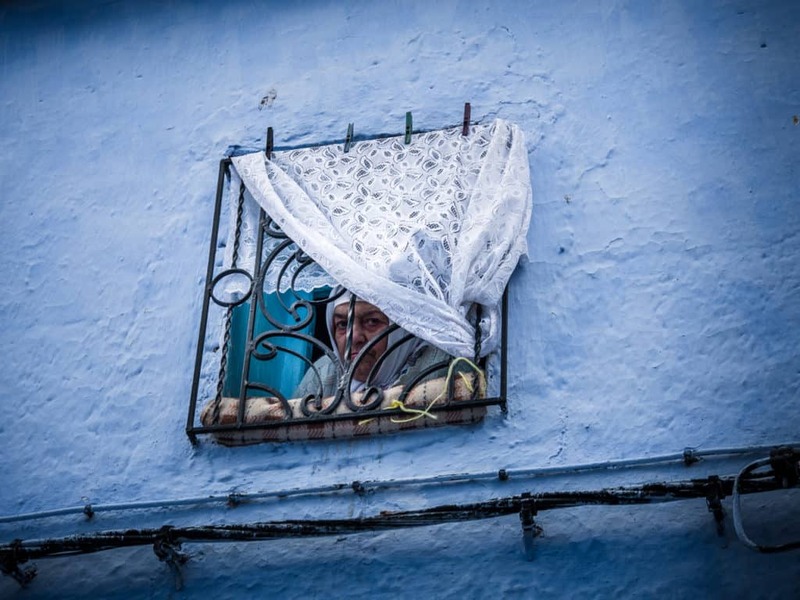 The amount of time you want to spend in Chefchaouen really depends on what you want to see and do. Niko and I spent about 3 days there as we also went on a couple of hikes around the city. 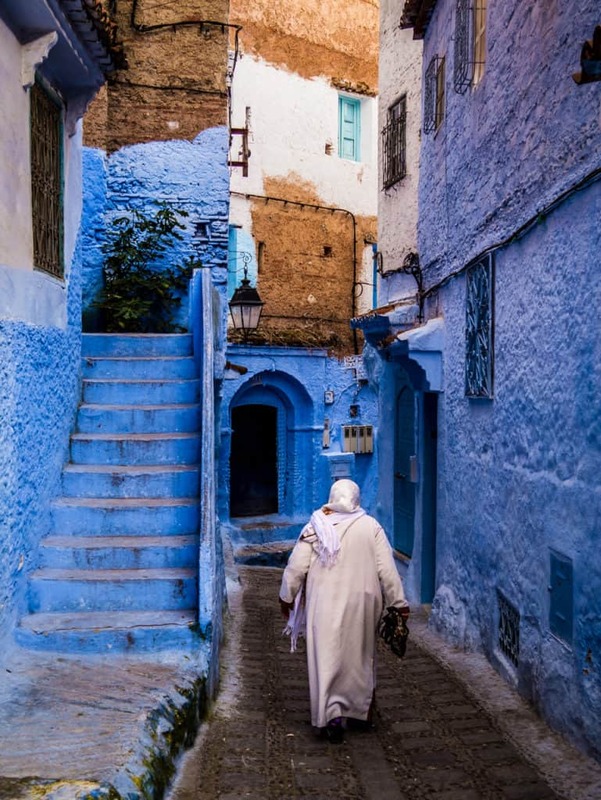 If you only have a limited amount of time in Morocco, I’d say that one full day should be enough to discover the ‘Blue Pearl’ as the old medina (Moroccan word for ‘city’) of Chefchaouen isn’t very big. 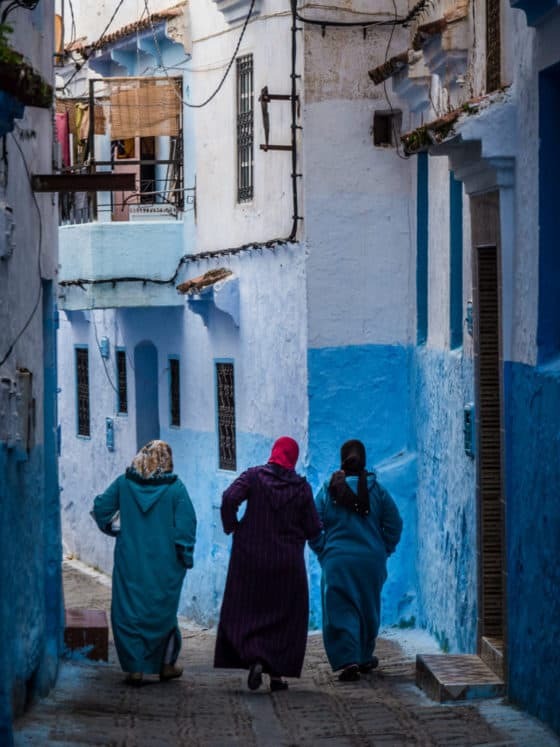 You can always book a day trip to Chefchaouen from Tangier or from Fez if you’re on a tight schedule. Click here to check prices for a guided day trip to the Blue City. If you like to explore some beautiful places in the nearby Rif Mountains, foresee at least a couple of days in the region. This might sound cliché but the old medina of Chefchaouen is really the place to get lost. There are so many small streets that you literally will lose your way at some point. You’ll discover many enchanting squares, doors and dead-end alleys that are all very photogenic. It’s also a fun way to see how the locals live. A few times we got invited by a baker or a weaver to visit their workshop and learn a bit more about their lifestyle (it helps if you speak some French or Moroccan Arabic like Niko does!). However, be respectful towards the local people when it comes to taking photos. They don’t always like having pictures of them taken, especially when their children are around. Ask first for their permission. If you want to take some pictures without having tons of people on them, you should hit the streets before 9 am. Chefchaouen starts coming to life around 10 am so you’ll have enough time to wander through the alleys without seeing a living soul, with the exception of the cats (and there are many of them!!). 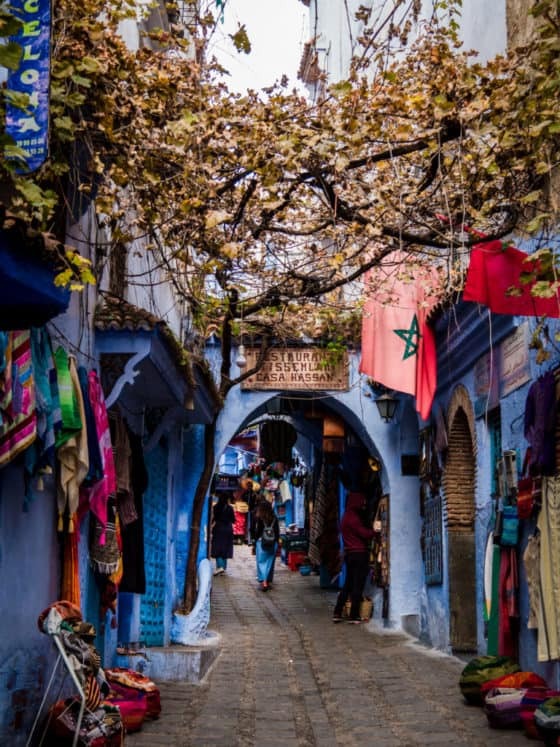 If you happen to be in Chefchaouen on a Monday or a Thursday, you should definitely visit the “souk”, the Moroccan word for market. 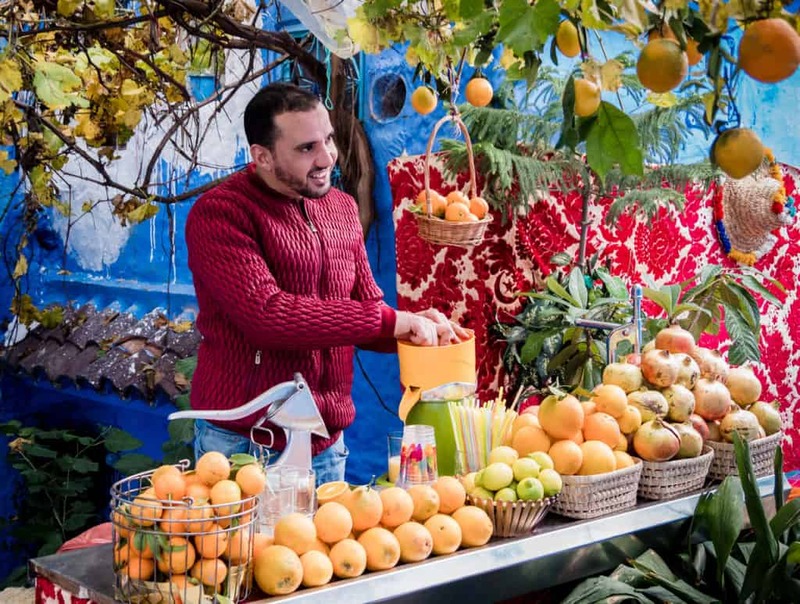 During these days the farmers of the Rif valley come down to the streets of Chefchaouen’s old medina to sell their products. This can vary from fruits and vegetables to handmade crafts and mountain herbs. 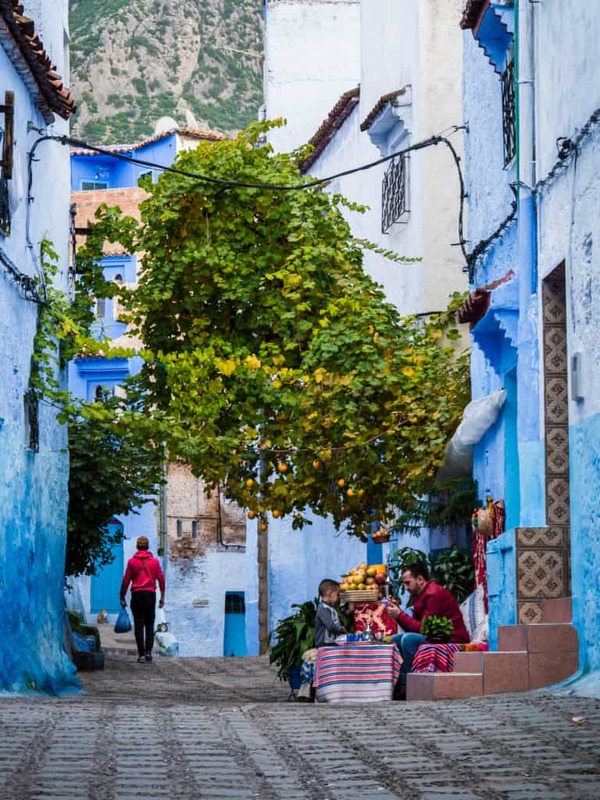 Many of the small streets in Chefchaouen are occupied by little bazaars that sell local crafts, arts, clothes, and traditional souvenirs. It’s a treat for the eye to see all the colorful wares being displayed against the blue walls. At times it can feel a bit claustrophobic as there isn’t much space to walk when all the wares are out but it surely is a sensory experience to wander through all the little bazaars. You’ll also come across many workshops where you can see the locals craft their goods. 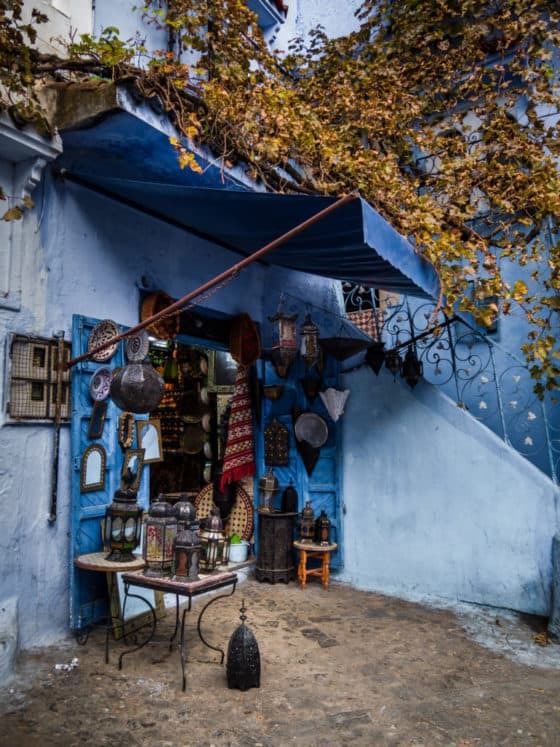 If you don’t only want to enjoy the aesthetics of the Blue city but also learn more about the history, customs, and art of the Chefchaouen region, you should pay a visit at the Kasbah museum. This ethnographic museum is located in the center of the old medina, right near Plaza Uta el-Hammam and is surrounded by a beautiful lush garden. The best place to enjoy a beautiful panoramic view over Chefchaouen is at the Spanish mosque. This mosque sits on a hill to the east of the city and it’s a 45-minute walk to get there. The trail begins from Bab al Ansae, the medina’s eastern gate and passes a river where you might spot some women doing their laundry. The best time to hike up there is on a clear day before sunrise or sunset, during which you’ll have a spectacular view over the blue city and the peaks of the Rif mountains. 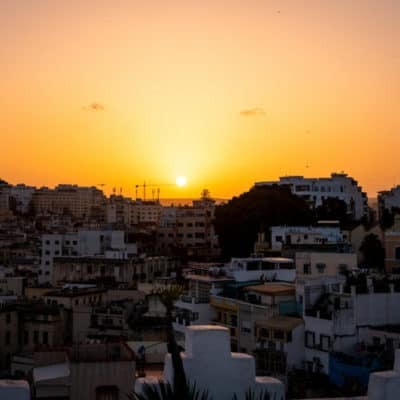 If you don’t feel like making this hike, you can always find a rooftop terrace (many hostels and hotels have one) from which you can enjoy the sunrise or sunset over the city. If you prefer more luxury and privacy, the Lina Ryad and Spa is known to be the best hammam of Chefchaouen. 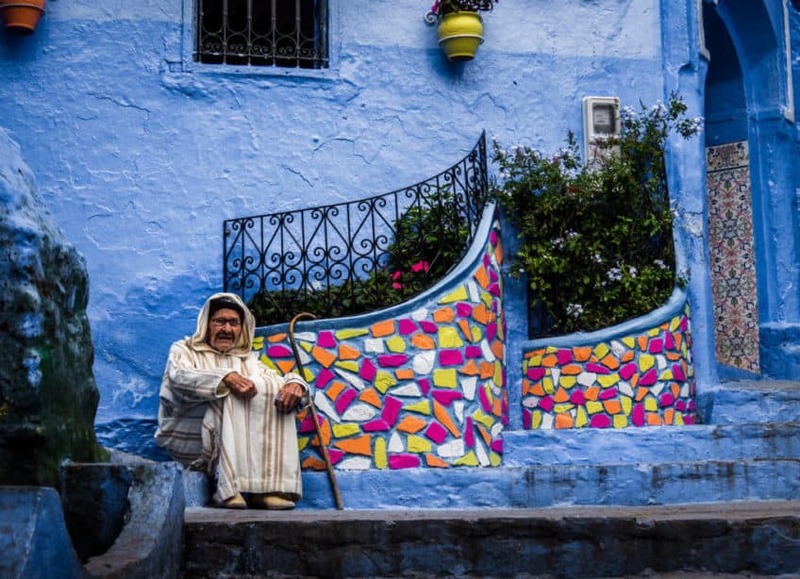 Don’t expect to find nightclubs or bars in Chefchaouen. 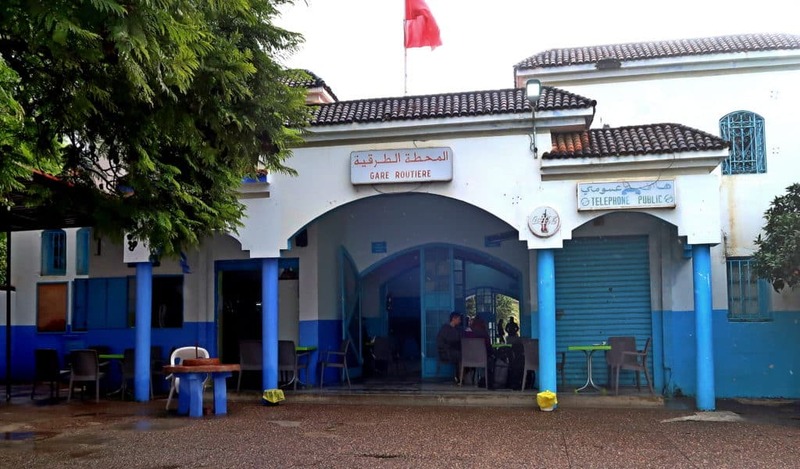 The only place where you might find some alcohol is at the bar of Atlas Chaouen or Hotel Parador but according to the Lonely Planet, there isn’t much ambiance in either hotel. However, a nice place to enjoy the evenings is Plaza Uta El-Hammam in the heart of Chefchaouen’s old medina. 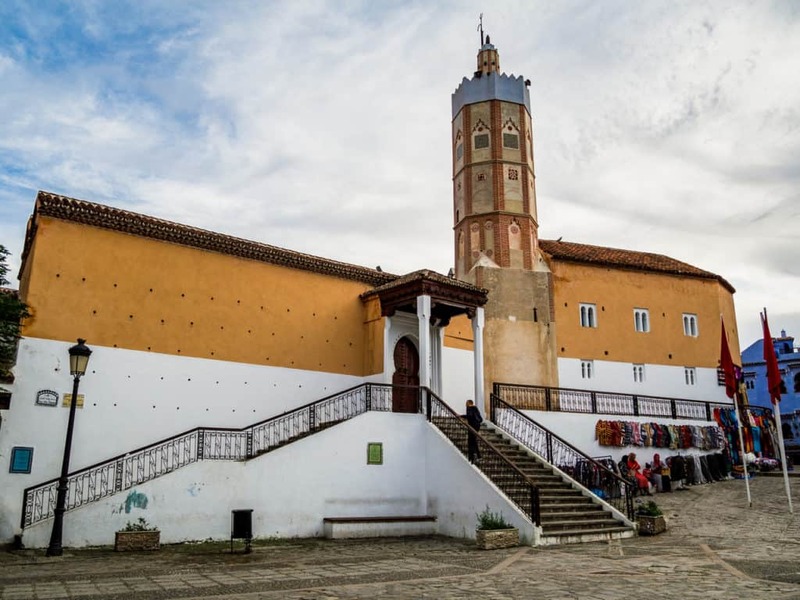 The square is lined with restaurants and little cafes where you can enjoy a traditional Moroccan dish or tea while breathing in the local atmosphere of the plaza. 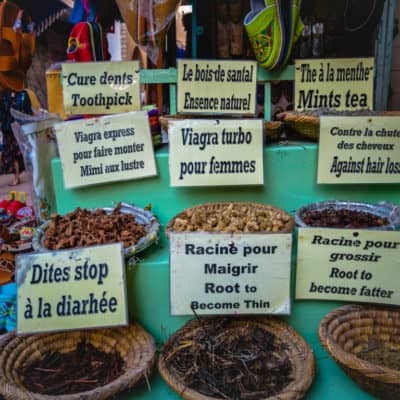 It might be hard to find alcohol in Chefchaouen but you surely won’t have troubles finding hash! Everywhere you go, you’ll get the hint of hashish filling the air. I had no idea but apparently, Chefchaouen is quite notorious for being the hashish hub of Morocco. Niko and I got offered some hashish by local dealers at least 8 times per day. I can’t tell you how much the hash costs as we don’t smoke it but apparently it’s very cheap and you won’t likely get in trouble for buying and smoking it in Chefchaouen. 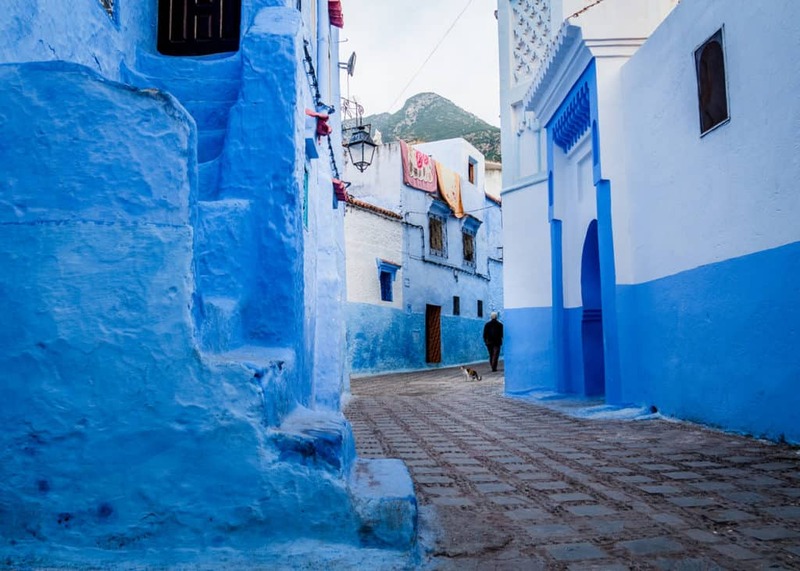 While you’re in Chefchaouen and you have a spare day or two, you shouldn’t just admire the surrounding mountains from the streets but go on a hike or on a day-trip to enjoy the beauty of the Rif Mountains. 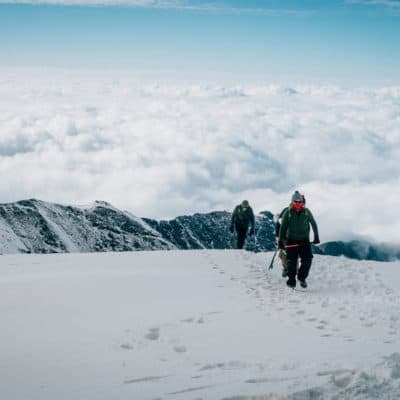 The best time to hike in the Rif Mountains is from April to October but if you can handle some cold and possibly snow, you can hike all-year round as long as you’re well-prepared! There are a few nice hiking trails that start just outside the city center of Chefchaouen and lead into the nearby Rif Mountains. 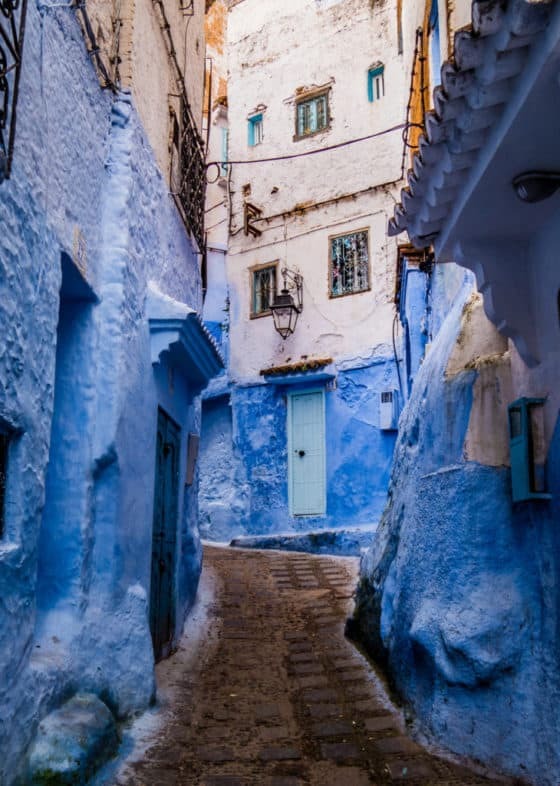 A popular one is a pathway that leads just behind the waterfall of the Ras el’Ma River while hiking into the direction of the Spanish mosque (see number 5 in the list of things to do in Chefchaouen above). The trail to Jeb al-Kalaa, the peak overlooking Chefchaouen, is a scenic but intense hike. You definitely have to have a certain level of physical fitness to be able to walk all the way up and back. The hiking trail isn’t always well-marked so you need to keep an eye out for the white and yellow markings if you don’t want to get lost. The whole loop can take about 9 hours so wear comfortable hiking shoes and bring enough water and snacks. The trailhead starts near the campground located above the old city. Along the two hiking trails mentioned above, you’ll come across some marijuana farms. 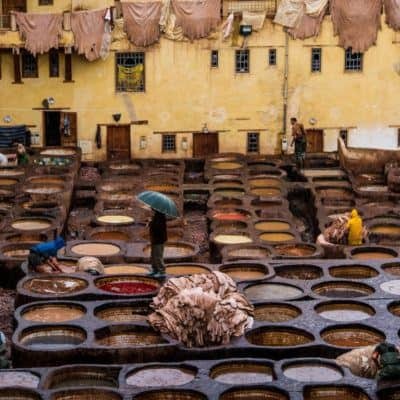 If you’re interested in how to hashish is produced, you can visit one of these farms during the month of November once the harvesting of the plants is done. However, ALWAYS ask permission first as not all the farmers are happy to have visitors. They are generally very friendly and are very likely to show you the process of making the hashish as long as you don’t take any photos to protect their privacy. A small tip or contribution (anywhere between 50 and 100 dirhams) is also always appreciated. 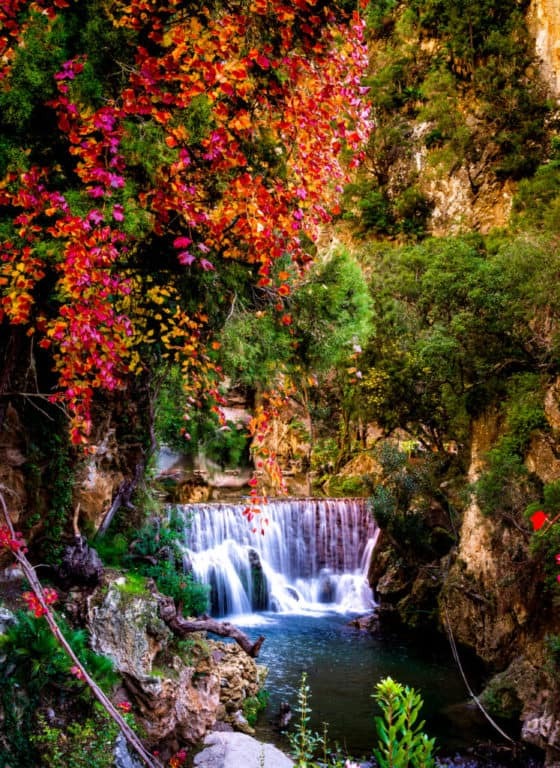 The Akchour Waterfalls and God’s Bridge are two very special places near Akchour, a small town located at a 45-minute drive from Chefchaouen. 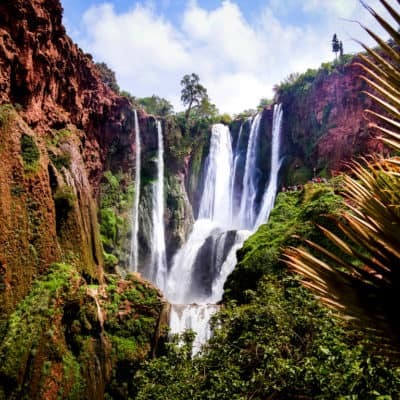 The Akchour Waterfalls are possibly the most beautiful waterfalls I’ve seen in Morocco and God’s Bridge is a very unique rock formation that looks like a stone arch standing over the Akchour river. Both places are located near each other and can be visited within one day if you get there early enough. 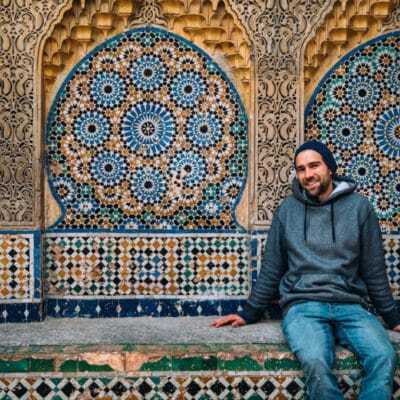 Read: How to get to the Akchour Waterfalls and God’s Bridge from Chefchaouen. The Talassemtane National Park was created in 2004 to conserve the last of Morocco’s fir forests. 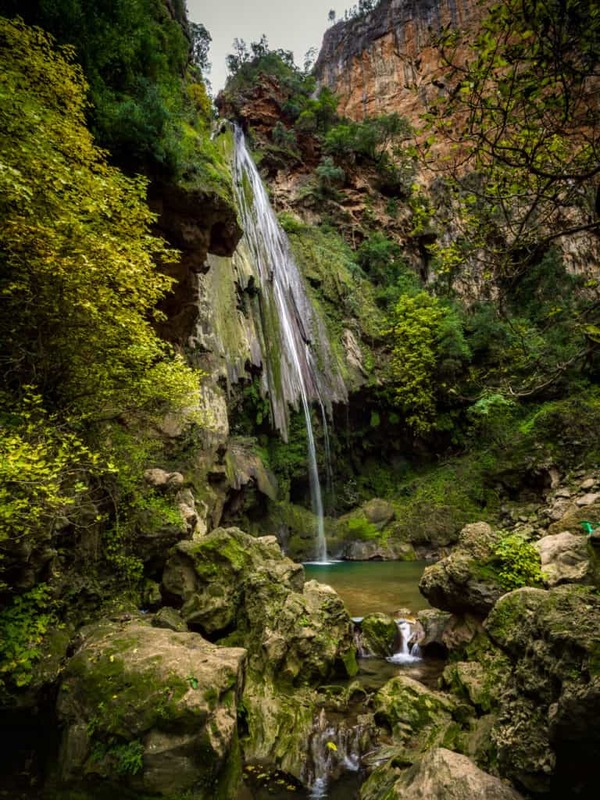 Talassemtane means ‘cold spring’ in Berber, named after the many cascades and waterfalls you can find in the park. 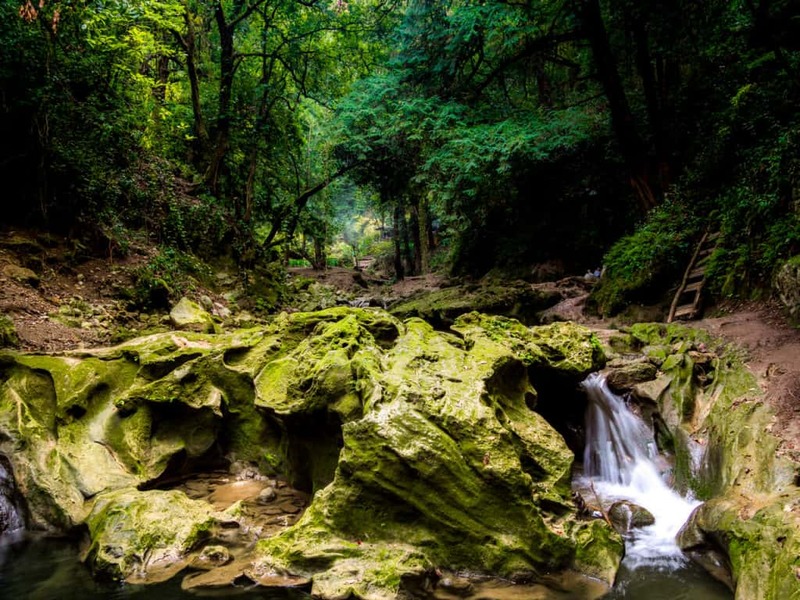 One of the most popular trails in the National Park are the ones to the Akchour Waterfalls and God’s Bridge (see above) but you can also go on a multiple-day trek all across the National Park. You can find more information and trekking routes on the website of Gitetalassemtane. 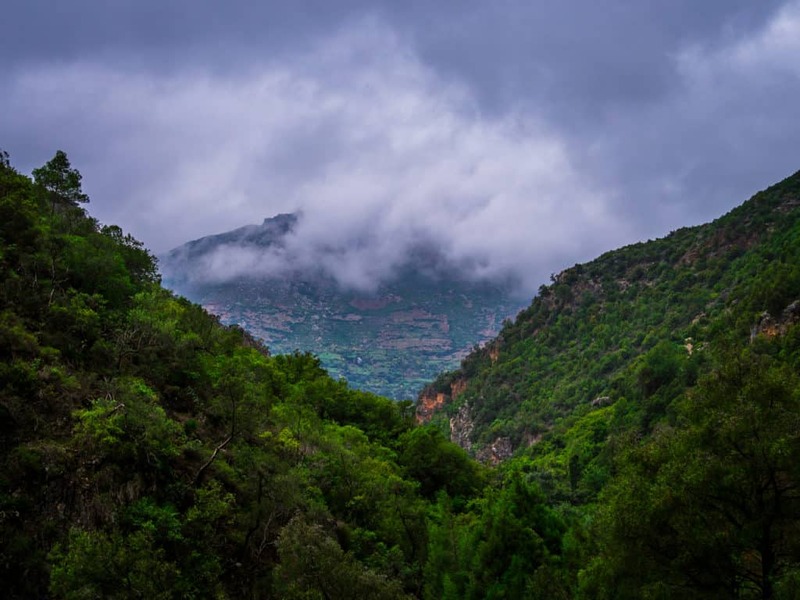 If you’re traveling by car or if you want to keep your costs really low, you can always stay at Camping Azilan, a campground located halfway up a mountain overlooking Chefchaouen. It’s about 5 minutes walking to get to the old medina. There are toilets, cold showers, wi-fi and electricity available on the campsite, as well as a little shop and restaurant. There’s also a hostel located just outside the campground. Click here for more info and prices. Niko and I shared a private room at Hotel Souika. It’s the cheapest hostel in town and has several dorm rooms as private rooms. There’s also a fantastic rooftop terrace from which you have a great view over the city and mountains. Click here to see the prices and availability of Hotel Souika. Another hostel we also recommend is the Dar Bleu Pearl. View from the rooftop terrace of our hostel! 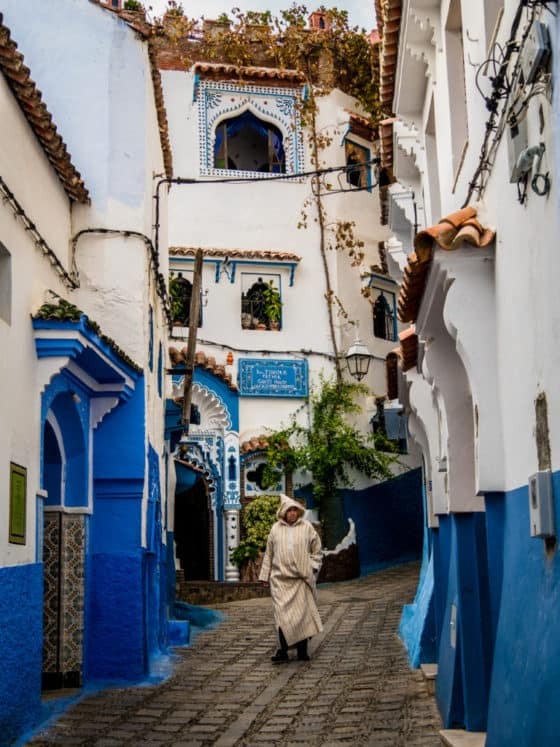 If you like to have a bit more luxury, you can always book a room at one of the many mid-range hotels in the old medina of Chefchaouen. Prices vary from $20 to $40 per room per night. We recommend Dar Elrio, Hotel Sandra and Usha Guesthouse. Book early as they fill up quickly! Booking a private room in Chefchaouen through Airbnb is also a relatively cheap solution. You can already find rooms for $15 per night! If you’re new to Airbnb, click here for a discount! 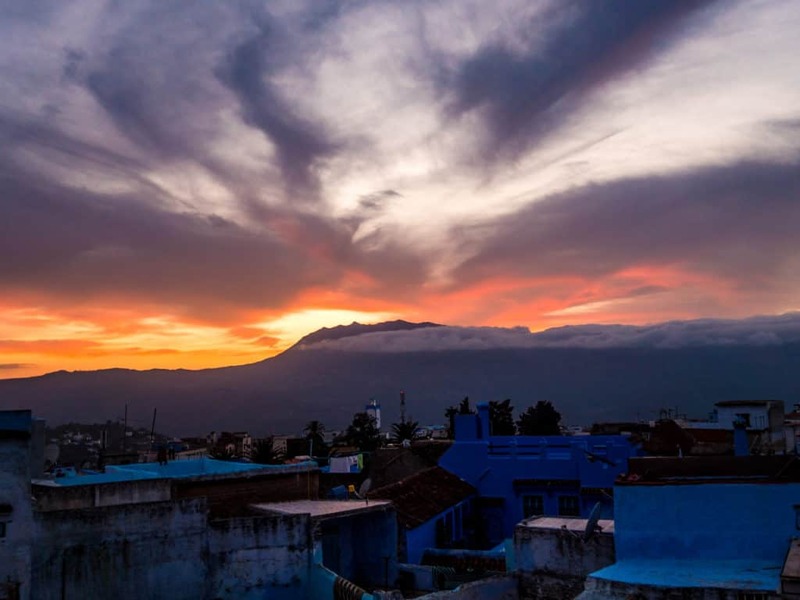 If you’re looking for a more luxurious stay in Chefchaouen, you should book a night at Casa La Palma and La Petite Chefchaouen. Both are very beautiful hotels but still affordable. If you really want to indulge yourself, why not stay at the Lina Ryad & Spa! The only way to get to and leave from Chefchaouen by public transport is by taking a bus or a taxi. The latter can turn out very expensive and I can honestly say that traveling by bus in Morocco is actually very comfortable, depending on the bus services you use. I highly recommend you take a CTM bus. CTM is the most reliable bus company in Morocco. It’s the priciest company out there but at the same time, it’s still very cheap. You can also book your journey with them online. The buses are new, comfortable and have airconditioning, something you’ll enjoy during a long journey on a hot day. Nejme Chamal is the second best bus company. Their buses are also quite comfortable but you can only buy your ticket at the bus station. There are two bus stations in Tangier where you can take a bus to Chefchaouen. One of them is the main city bus station “Gare Routiere” at Place al Jamia al Arabia (see map below). This is where you can take the Nejme Chamal bus. 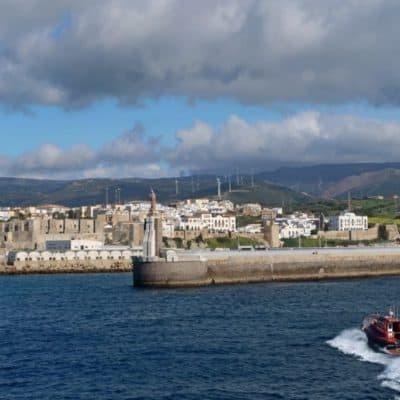 There are several buses leaving daily from Tangier to Chefchaouen. The price for a ticket is 45 dirhams, and you have to pay 10 dirhams extra for your luggage. 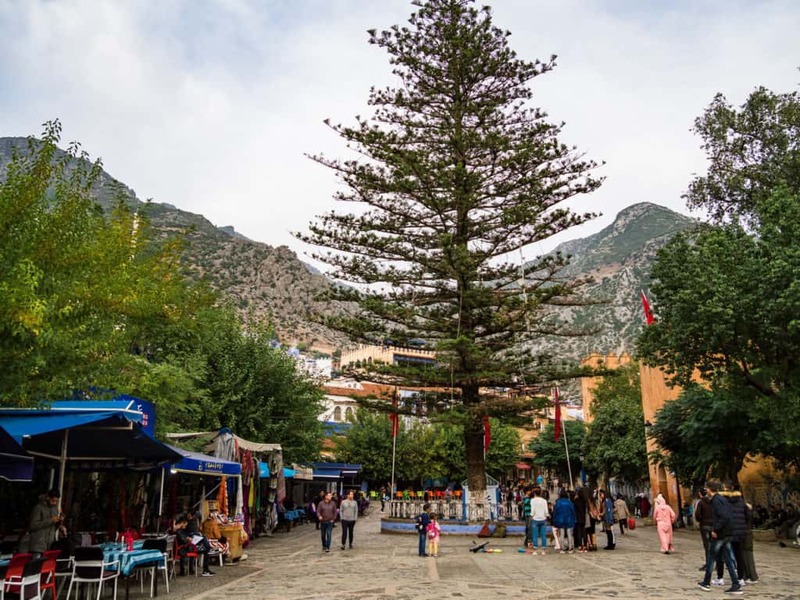 The bus journey takes about 3 hours but it can happen that you’ll have to get off the bus at some point and that you’ll be put in a taxi (you don’t need to pay extra) if there aren’t enough people on the bus going directly towards Chefchaouen. 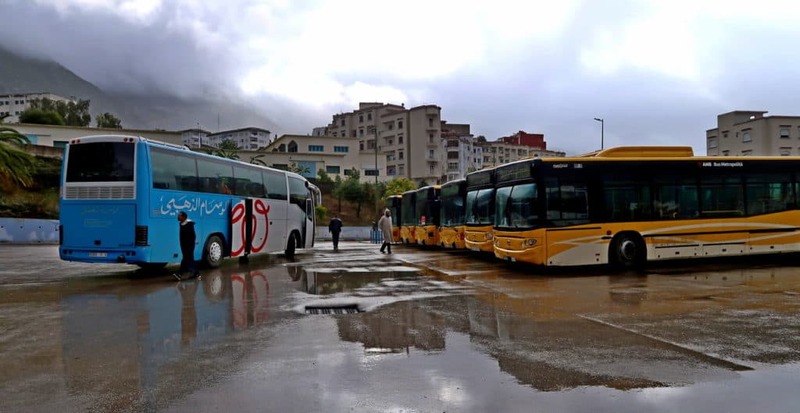 The second bus station, “CTM Gare Voyageurs” isn’t so conveniently located but these buses go directly towards Chefchaouen and you get some extra comfort for the same price that you’d pay for the Nejma Chamal bus. There are daily several CTM buses that go from Tangier to Chefchaouen and the bus ride also takes about 2 hours and 45 minutes. It’s also 45 dirhams per person, 5 to 10 dirhams for your luggage and you can book your ticket in advance online. However, if you book your ticket online, you still have to go to the CTM office to pay for your luggage so make sure you arrive at least 30 minutes before departure. There’s daily one CTM bus that goes from Casablanca to Chefchaouen at 13h30. The bus ride takes about 6,5 hours (with some toilet and food breaks in between) and one ticket costs 160 dirhams (+ 10 dirhams for your luggage). You can catch this bus at the CTM bus station in Casablanca on Rue Léon (see map). As there’s only one bus a day, it’s better to reserve your ticket in advance at the bus station or book it online. However, if you book your ticket online, you still have to go to the CTM office to pay for your luggage on the day of departure so make sure you arrive at least 30 minutes in advance. There are daily about 4 CTM buses that go from Fes to Chefchaouen. The bus ride takes about 4 hours (with a toilet and food break in between) and one ticket costs 75 dirhams (+ 10 dirhams for your luggage). You can catch this bus at the main CTM bus station in the new city of Fes (see map). This bus station is about 6km from the old medina so you’ll have to take a taxi to get there (anywhere between 10 and 20 dirhams). You can buy your ticket at the bus station or book it online. However, if you book your ticket online, you still have to go to the CTM office to pay for your luggage on the day of departure so make sure you arrive at least 30 minutes in advance. If you want to leave from another city to Chefchaouen, check the departure times and prices on the CTM website. There’s no direct bus going from Marrakesh to Chefchaouen as there’s a huge distance between both cities. The best way is to fly or take the train from Marrakesh to Fes and from there take the bus to Chefchaouen. There’s only one bus station in Chefchaouen from which buses leave to other destinations (see map below), which is located about 30 minutes walking from the old medina. You can walk there or take a taxi for 15 dirhams. You’ll find both CTM buses as Nejme Chamal buses leaving at different times during the day. If you want to travel with CTM, you should buy your ticket in advance, whether at the bus station or online. 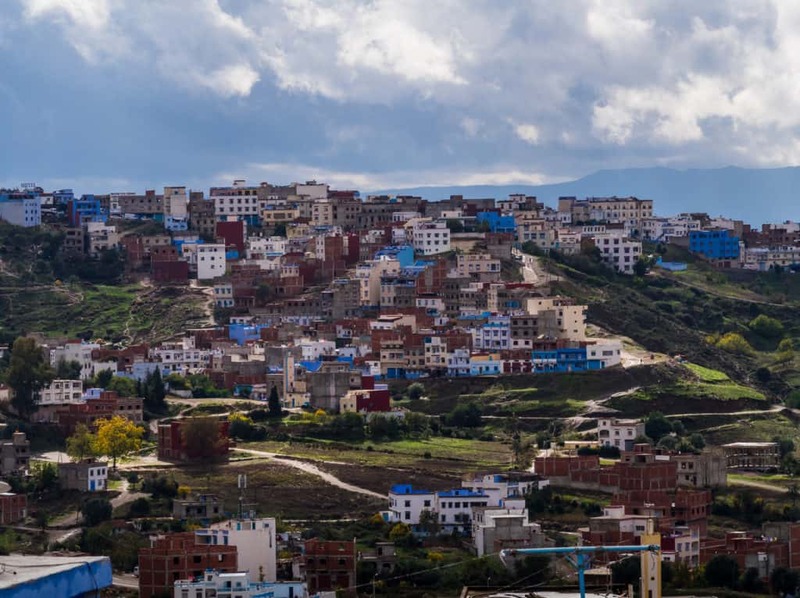 There are several buses leaving daily from Chefchaouen to Tangier. A ticket costs around 45 dirhams + 5 to 10 dirhams extra for luggage and the ride takes about 2 hours and 45 minutes. Check timetables here. There’s one bus leaving daily from Chefchaouen to Casablanca at 7 am. A ticket costs around 165 dirhams + 5 to 10 dirhams extra for luggage and the ride takes about 5 hours. As there’s only one bus per day, you should book your ticket in advance at the bus station or online. 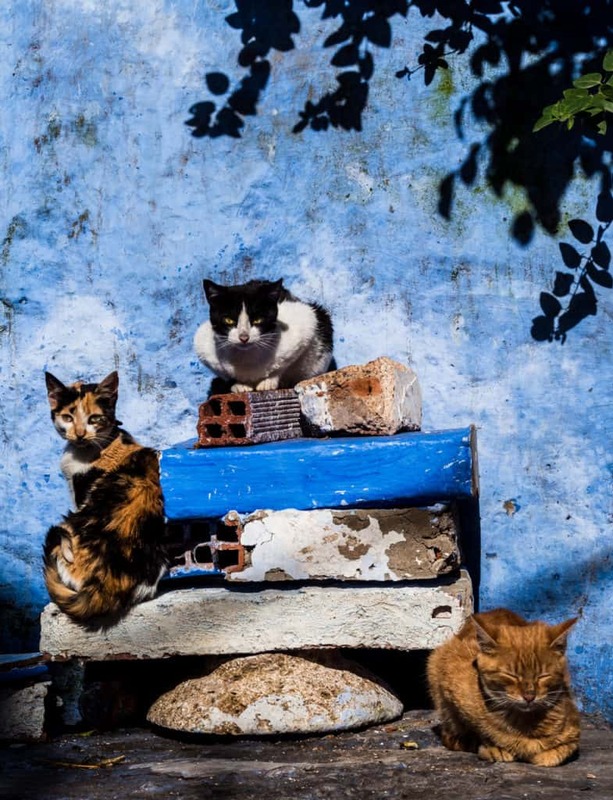 There are several buses leaving daily from Chefchaouen to Fes. A ticket costs around 75 dirhams + 5 to 10 dirhams extra for luggage and the ride takes about 6 hours. Check timetables here. 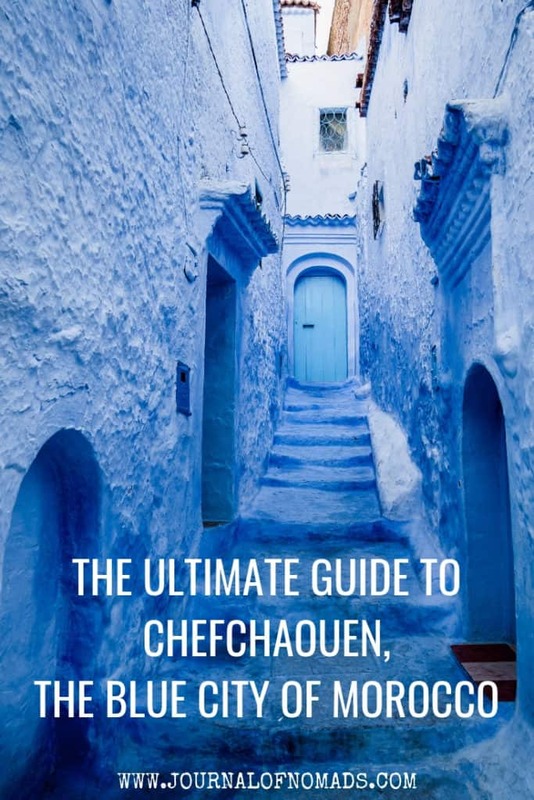 I hope this guide was useful and that you’ll enjoy your stay in Chefchaouen as much as we did! 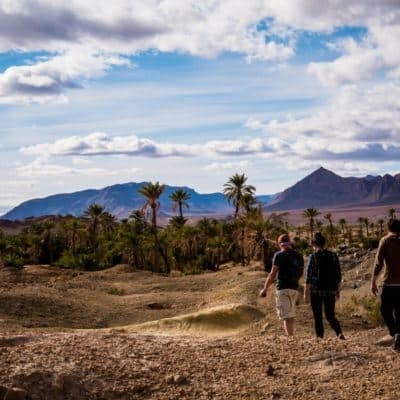 Read more Guides on Traveling to Morocco! 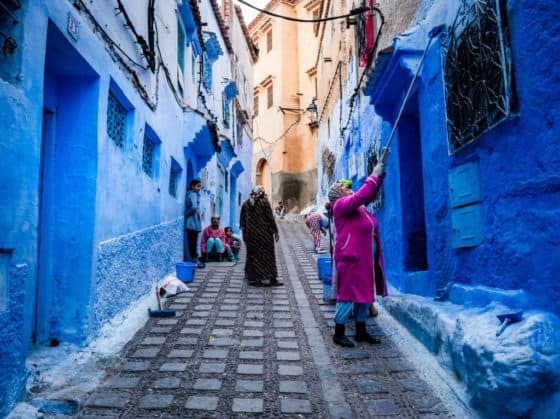 Do you have more questions about Chefchaouen? 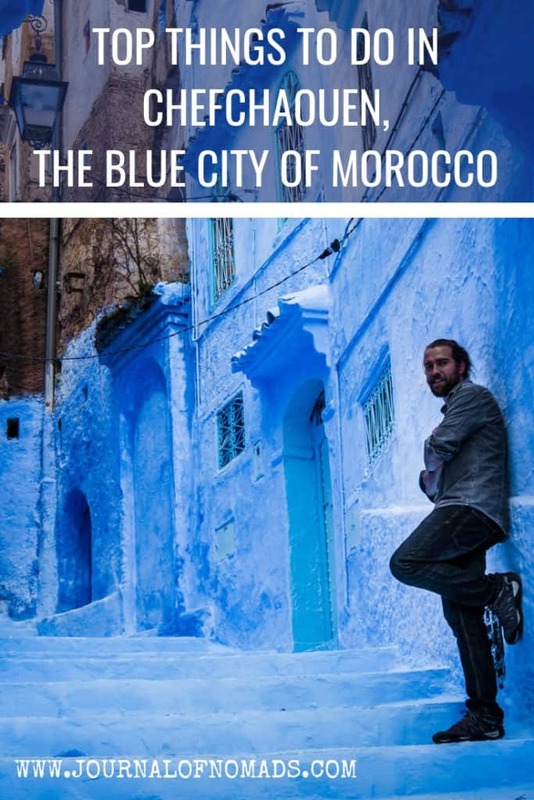 Have you been to the Blue city before? Please ask your questions or share with us your experiences in the comments below.